I think it’s fair to say that Wale’s come up a little short when looking at the ratio of hype to output. An obviously talented rapper, but with the near-flop of an album that was Attention Deficit, followed by two fairly predictable LPs- Ambition, and The Gifted. With the release of his fourth studio album The Album About Nothing set to be released in 2015, Wale has come together with Fool’s Gold founder and self confessed hip-hop head A-Trak to release the mixtape Festivus. The project features an array of guest spots including A$AP Ferg, Chance The Rapper, Pusha T and Ab-Soul, and looks to continue the Seinfeld theme often applied to his projects. 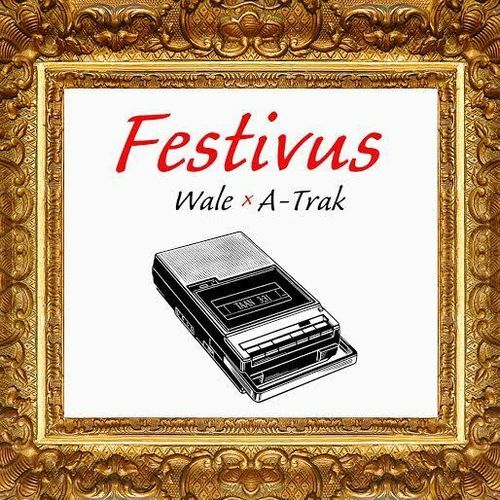 The opening track of Festivus is among the best, with A-Trak’s world-renowned record scratching bringing the track to the boil, ready for Wale to spit some ‘strokes of genius’, it’s one of Wale’s most instantly likeable tracks. The album jazzes up with Tonight, featuring harmonic background vocals, a soulful hook, and bongo drum-esque production, it also samples a song that I can’t for the life of me remember. A children’s choir come in to cement opinions of solid production with Girls On Drugs, and again makes for one of the mixtape’s stronger points. Unfortunately for Wale, his voice makes him often sound a bit too much like Wiz Khalifa for my liking, but in terms of real ability, they’re miles apart when it comes to lyricism, and Festivus is evidence as to why I think this. One of the many highlights of the project is the Ab-Soul-assisted Keep It Moving, the duo have a match-made-in-heaven-style chemistry with the duo swapping bars across a whirring beat that left a lot down to the MCs. Festivus is a strong project, and had I reviewed it before compiling my 20 Albums of 2014 list, it would have probably made the cut. The production is measured and the combination of A-Trak and Wale is a welcomed diamond combination, it beats leave a lot on Wale’s part, but still retain a degree of inventiveness and intuition courtesy of A-Trak. Like most mixtapes nowadays the album still has those shoddy filler tracks, in this case the Chief Keef inspired Loyalty, but with Festivus, the hits more than makes up for the misses. You can download Festivus here, or stream it via Soundcloud above.